This hulk of a man (actually, more a Ben Grimm than a Bruce Banner) stood just next to me earlier today, and I'm still feeling kinda shaky. 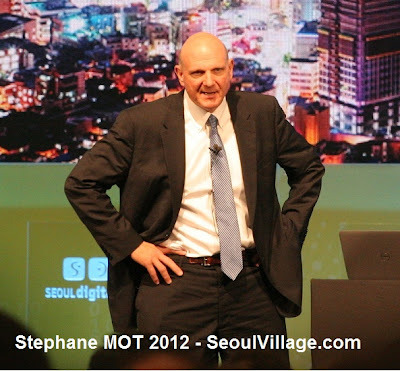 Luckily, I was not alone in the room with Microsoft CEO Steve "The Thing" Ballmer, who minutes later howled his usual pitch on stage at the 2012 Seoul Digital Forum (W Sheraton). The theme today? "Coexistence". As if you could coexist with this kind of player. Now I'm comfortably sitting in the press center, waiting for a second round of power hitters. More about it later. According to Thomas Friedman NYTimes column, MSFT has almost 5,000 unfilled jobs. I wish Steve would hire some Koreans in Seoul.